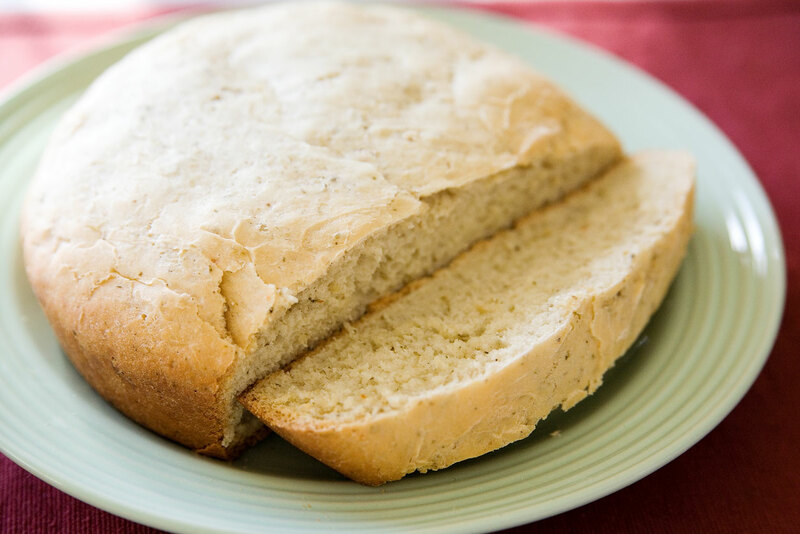 Published on February 18, 2009 August 9, 2016 by Bobbi-Jo G.
I haven’t shared a recipe for a while, and since I just HAPPENED to make this yummy slow cooker bread today for supper with the Missionaries, why not share it with you?? Okay, back to the Herb bread, after all you came her for the recipe not for my ramblings, am I right? Stir the first amount of sugar in warm water in a large bowl. Sprinkle with yeast. Let stand for 10 minutes. Stir to dissolve the yeast. Add the next 8 ingredients. Beat on low to moisten, then beat on medium for about 2 minutes. Work in the second amount of flour and knead. Turn into a greased slow cooker. Smooth the top with your hand, or a wet spoon. Place 5 paper towels between the top of slow cooker and lid (this will absorb some of the moisture from the steam) then stick a wooden match, or some other object about an 1/8 of an inch thick between the paper towels and the edge of slow cooker to allow some steam to escape. I literally just used a handle of a spoon. Do not lift the lid for the first 2 hours of cooking! Cook on high for about 2 1/2 hours. Loosen sides with a knife and turn onto a cooling rack. Cut into slices and enjoy! This is really, really yummy with bruschetta (seriously yummy!). One hint, if you don’t have the spices they mention, I just added 2 1/2 tsp of Italiano seasoning and a pinch of salt and it turned out SUPERB! Another great thing about this bread is, it doesn’t need milk or eggs, or any fresh ingredients, really. What a great way to use up some food storage, right? No waiting for bread to rise, no using up your oven, no worries. It’s a delicious bread – I hope you’ll try it! This is AWESOME! Thanks for sharing! You KNOW I am ALL about food and Slow Cookers! LOL! Can’t wait to try this tomorrow. Nora – the recipe says to use a 3.5 quart (I think( slow cooker) so if yours is bigger, you should probably double the recipe. I tried a chocolate fudge pudding cake in my slow cooker and it was SO GOOD!! interesting. I am going to have to jump around your blog to find the cake in the slow cooker ect. are you serious, melissa sent me over. Great blog. Mmm, I’d like the choc fudge pudding recipe too!I made this today and it turned out good. Of course I had to make a few adjustments (when do I ever have ALL ingredients I need on hand?) and I might have cooked it a tad too long, but hey – slap on some butter and away we go. Yum! Thanks for the recipe Bobbi-Jo.